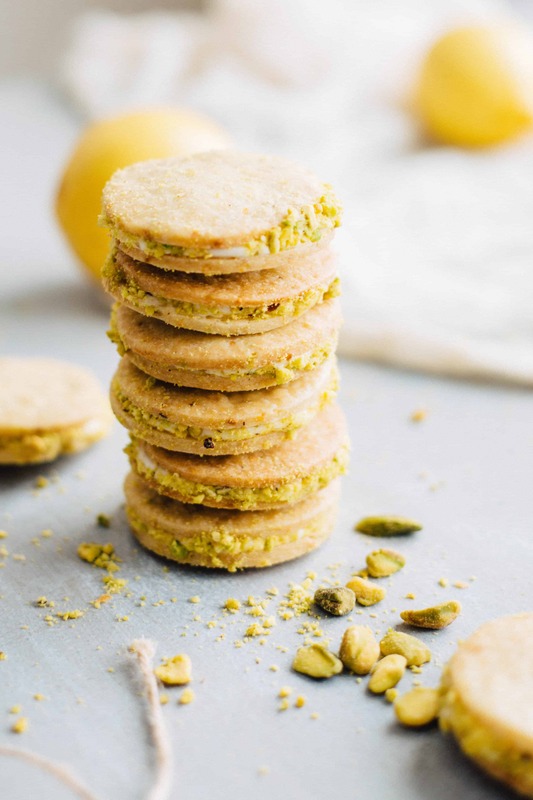 These sweet and puckery Meyer Lemon and Pistachio Sandwich Cookies are kissed with a touch of cardamom to make them even more unique. Cookies are the reason for my season. Just about the second I polish off the last of our Thanksgiving pies, my brain turns to cookies. I suppose the term “Christmas Cookies” refers to a certain few confections that show up only this time of year – snickerdoodles, linzer cookies, gingerbread men, my Grandma’s chocolate spice cookies (I’m sorry you will never see a recipe for these because no one likes them but you, Aunt Ang), and those powdered sugar covered, nut-flecked balls of shortbread that seem to go by a thousand different names depending who you ask. But in my eyes, any cookie can be a Christmas cookie if it tries hard enough. Who gets to make that decision, anyway? These cookies are far from a traditional Christmas cookie, and that’s exactly what I like about them. Being a sandwich cookie, they are a bit fussier and more time consuming to make than a standard drop-cookie, but that’s what makes them so much more fun. Short, chilly days invite cozy baking projects, and the holidays are the perfect time to dive in. You’re going to need something to do with all those cookies, and I’m willing to bet you have plenty of parties and friends and festivities that require something sweet. We’re now in that sad time of year when there’s no longer anything fresh coming out of my garden. I always shed a single tear when I realize I can’t just waltz into the backyard to cut down some leaves for a salad, and instead have to buy them in a neatly packaged box from the grocery store. Sure, it’s a million times easier than separating leaves from stems, triple washing and then drying, but they never taste quite as good. That said, the one silver lining of winter, the one thing I look forward to every single year, is citrus season. I use lemons and limes pretty liberally all year long, but this time of the year they’re the best. Fragrant, fresh, and loaded with juice (and usually less seeds too). Not to mention, they’re much cheaper. But best of all is there are lots of interesting varieties available. SO many different oranges. And my favorite: Meyer lemons. I’ve written before that Meyer lemons are like regular lemons written in cursive. There’s something fuller, fancier, and more interesting about them. They have a floral flavor and a slight sweetness that is unlike anything else. 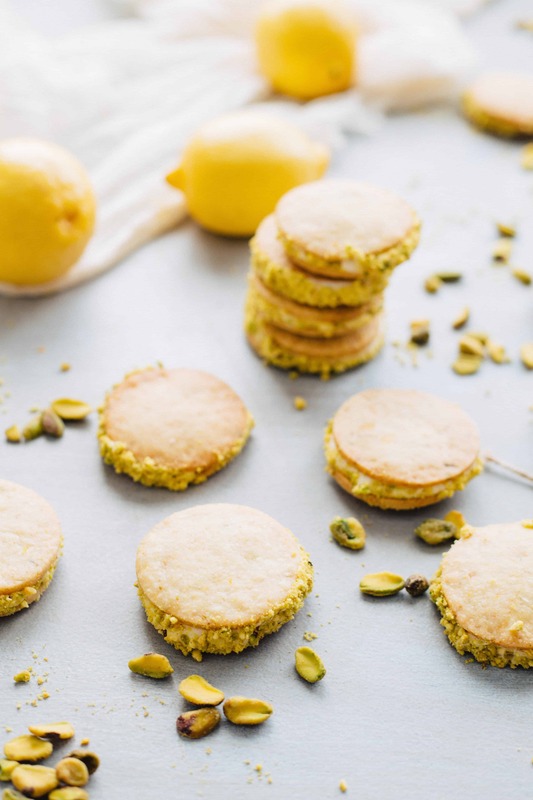 They’re wonderful in savory and sweet dishes and can be used anywhere a regular lemon can. 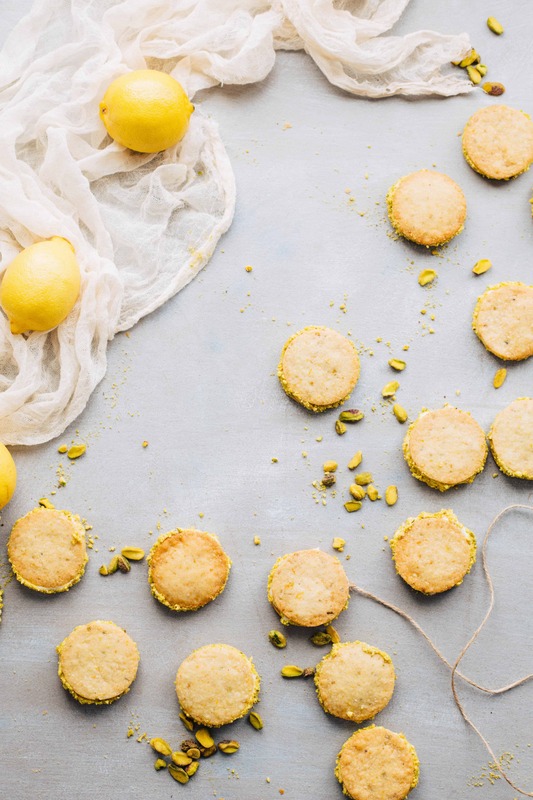 I’ve fallen madly in love with the pairing of Meyer lemon and cardamom, so I couldn’t resist joining them together once again for this recipe. 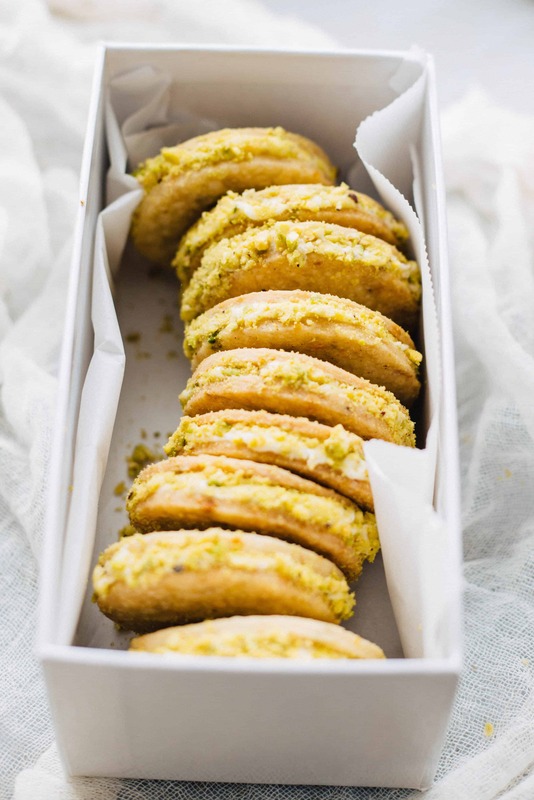 The outer layer of these cookies is thin, tender, and flecked with pistachios, while inside lies a sweet, creamy, and tangy filling. 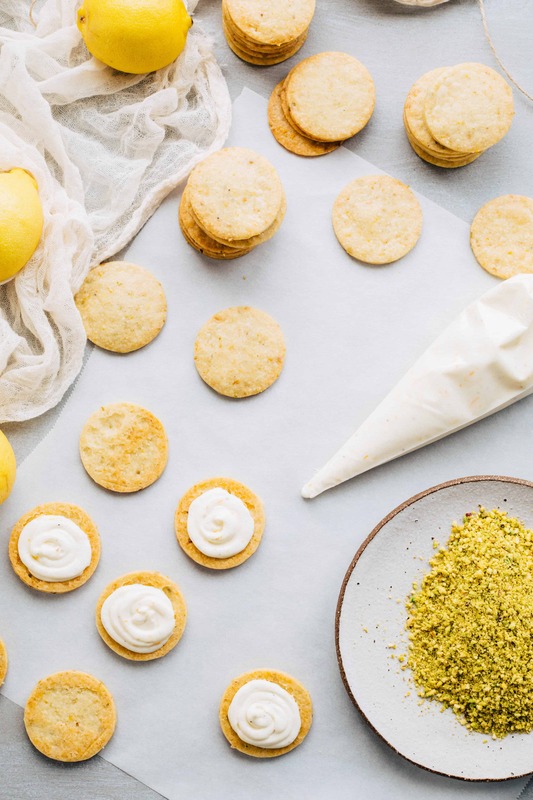 Both the cookies and cream are scented with warm cardamom and fragrant Meyer lemon zest, along with a reasonable amount of salt to balance out all the sweet. 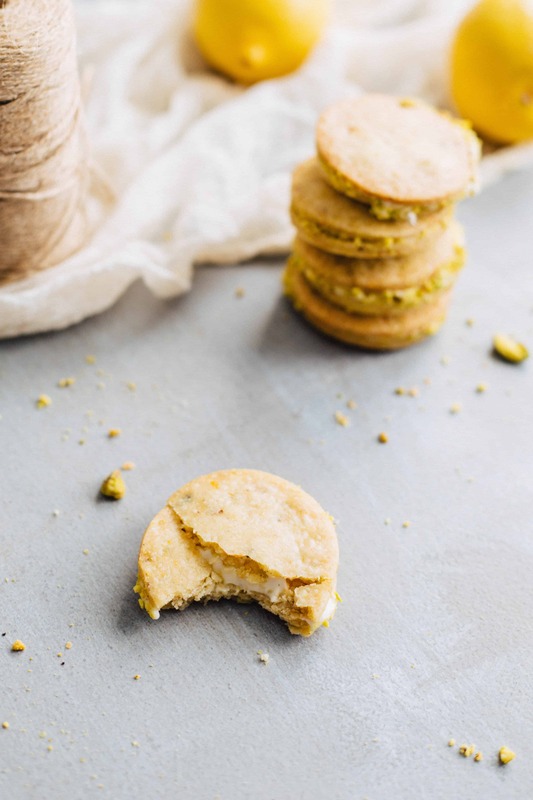 They have such a uniquely delicious flavor, and the chopped green pistachios gives them such an attractive appearance. Sandwich cookies are the best kind of cookies because it’s like getting 2-for-1. These delicate little beauties will steal all the attention on the dessert table, and they make a fine gift as well. Cream the butter and sugar together until light and fluffy. Add the salt, cardamom, Meyer lemon zest, and Meyer lemon juice, then beat until incorporated. Mix in 1/3 cup pistachios (reserve the rest for rolling), then add the flour and mix on low speed until just incorporated. Wrap dough in plastic, then refrigerate for 1 hour or overnight. Roll out dough to about 1/4-inch thick (you want the cookies to be fairly thin), then use a round 3-inch cookie cutter to cut out as many cookies as you can. Transfer to sheet pans, leaving about 1/2 inch between cookies. Reroll and cut dough scraps until you’ve used it all up. Bake cookies for about 15-20 minutes, rotating pans halfway throughout. Remove when they are light golden brown, then let cool completely. Beat cream cheese until light and fluffy. Beat in powdered sugar, one cup at a time, until smooth. Mix in salt, Meyer lemon zest, 2 1/2 tablespoons Meyer lemon juice, and cardamom. Taste and add more lemon if you want it tangier. Transfer to a piping bag or a zip-top bag with the corner snipped off (after filling). Place the remaining chopped pistachios on a small plate. Pipe about a tablespoon of filling onto the center of a cookie, then place another cookie on top and gently press down to seal. 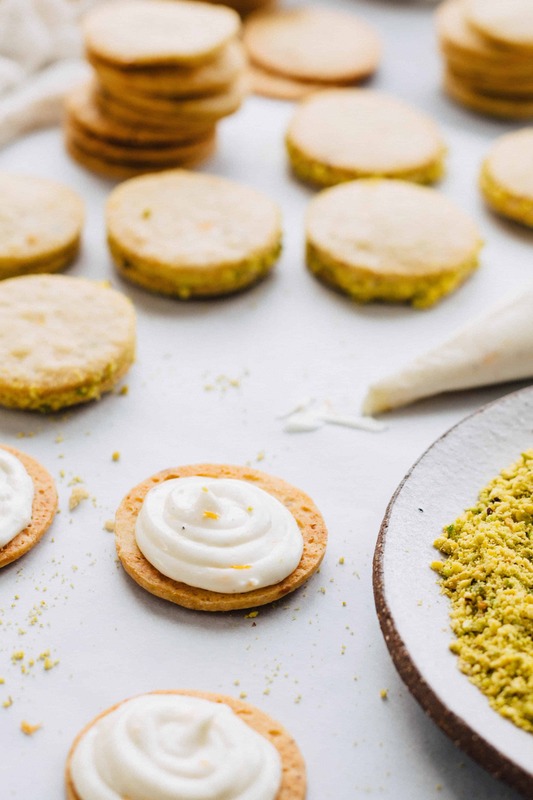 Roll the edges in chopped pistachios, then set aside and repeat with the rest. Let cookies sit without moving for about 1 hour to let the filling harden. Cookies will keep in the refrigerator for up to 1 week. Cookie of my dreams! I’ll tag you when I make them. So glad you made these!!! !